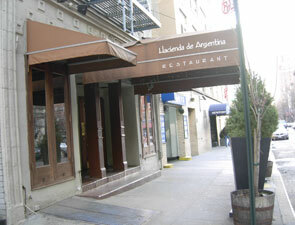 Situated between two parking garages -- a familiar site on the Upper East Side of Manhattan -- Hacienda de Argentina is accentuated by two dark, wood-framed windows, each covered with a chocolate canopy and the three wooden doors with windows (actually one is only used) which again are covered by a larger, chocolate colored canopy that stretches out toward 75th Street. This canopy is flanked on either side by large pots filled with luscious greenery. On the right side stands an easel displaying glowing restaurant reviews and a copy of the menu for your perusal. You'll have to go up two steps to get into the restaurant -- and down a flight of stairs with no elevator access, it's worth noting, to get to the restroom -- where you'll enter in through the bar and lounge area. It might take a minute or two for your eyes to adjust to the romantic lighting inside, but it's worth it. The bar area is quaint and has a table in the window from which you can look out onto 75th Street. Or you can sit and join the rest of the patrons at the richly hued wooden bar itself. There's pendant lighting and spot lighting, as well as candles situated in beautifully ornate holders on the bar. The dark hue and flickering candlelight is spectacular. As you come in, the bar is to the right and there's a slight wall to the left that separates you from a portion of the dining area. The bar is a great place to grab a drink either before or after your meal, or simply meet someone for a cocktail if you're looking for a romantic date environment, as it's not cavernous and adds just the right touch to the room. Once you pass the bar, you'll see an ornate wine rack at the edge followed by the expanse of the restaurant. There is another nook around the corner where the wall to the left of you stops as you enter the restaurant; it provides a dining option for those who would like cozy window seating, or even seating away from the main part of the restaurant, as there are two tables here, one in the window and a longer one against the wall. The brick walls create a comfortable ambiance that's both rustic and homey. Immediately in front of you to the middle is the communal table, which is sometimes used to seat large parties. 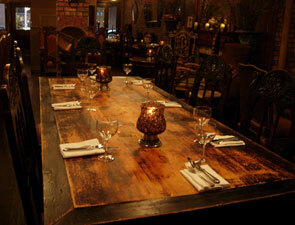 The table stretches lengthwise back through the middle of the restaurant and comfortably seats about eight people. It's flanked by two columns and immediately in front of the first is another table, this one perfect for a smaller sized party. The communal table is similar to the other tables in the restaurant in that it is an antique finished wood table; we were told that the furniture is authentic and was imported. It looks lovely. Equally lovely is the fireplace to your left if you are looking toward the kitchen; it adds to the romantic mood of the restaurant. So do mirrors, both circular and rectilinear, with ornate frames that decorate the walls of the restaurant along with an assortment of wall sconces and beautiful ornate glass candle holders, which are strategically placed throughout in order to provide romantic lighting.